The JDN mini air hoist series includes the mini manipulator device for one handed operation. 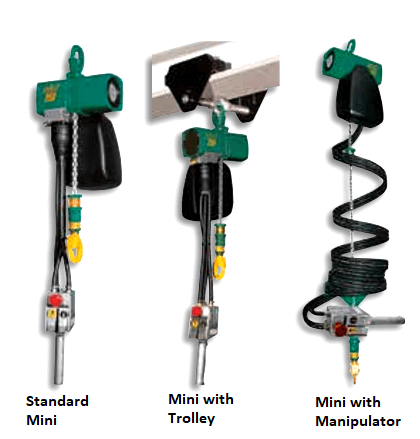 The mini range are ideal light duty air hoists. 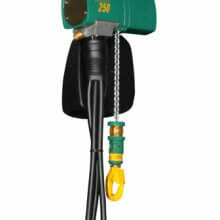 The JDN mini air hoist series incorporates 4 models with varying lifting capacities; 125kg, 250kg, 500kg & 980kg. They all operate on 6 bar air pressure or 85 PSI, and use a single fall of chain. The JDN mini air hoist was developed for light duty lifting applications, unlike the JDN Profi series which is for heavy duty lifting operations. 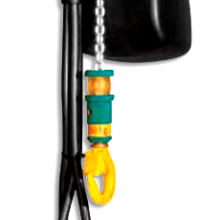 The Mini air hoist is suitable for use in hazardous areas and has an explosion classification of Atex II 3 GD IIA T4. These air hoists are lightweight and very easy to handle and are suitable for horizontal pulling. They are easy to maintain due to fewer components and can be used for lube free operation with the use of special oil free grease. The breaking system on the JDN mini air hoist has a wear resistant motor enabling smoother breaking for longer. The hoists incorporate a lever control which is very sensitive for precise operation; it also includes a shut off valve in case of emergencies. 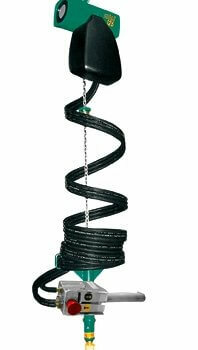 Three lifting heights are available as standard; 3m, 5m & 8m, the chain box also comes as standard to enable safe storage of excess chain. Other options also available include a manual trolley for easy beam attachment, and a mini tool box which makes transportation even easier, it consists of the mini hoist with a 3 metre lift, 2 metres of control cable and a 6 metre supply hose and couplings all in a robust transport box with carry handle. Lifting and lowering speeds are great with the standard 2m length of control; longer control hoses will lower the speeds. When fully loaded the 125kg model lifts at 15 m/min, the 250kg model at 8 m/min, the 500kg model at 10 m/min and the 1000kg model at 5 m/min, obviously the lifting speeds will increase with lighter loads and when unloaded; The lowering speeds when fully loaded are; 125kg = 30m/min; 250kg = 16 m/min; 500kg = 18 m/min; 1000kg = 10 m/min; when lowering without a load the speed will decrease as there is no additional weight to apply extra forces to help it down. 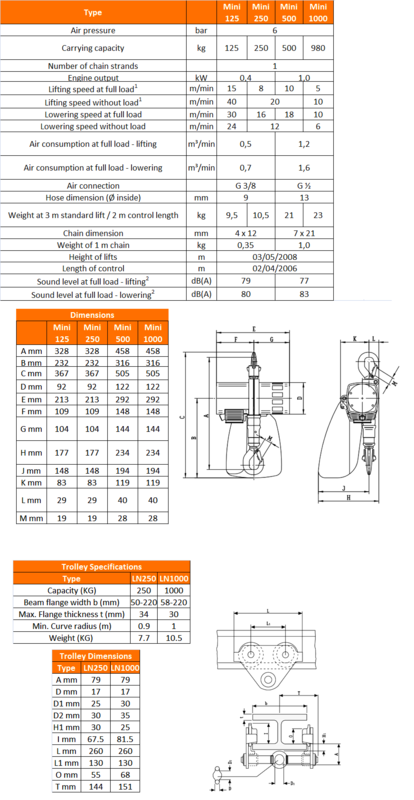 For more technical specifications and dimensions please refer to the specifications tab, or download the PDF version in the next tab. 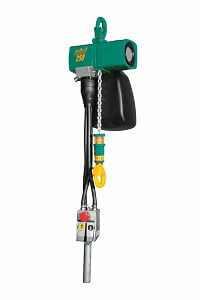 A further key advantage to the JDN mini air hoist range is the manipulator tool; this is available on the 125 kg and 250 kg models. With the addition of the mini manipulator tool loads can be lifted, lowered, traversed and fed with ease. Operated single handedly the JDN Mini manipulator air hoist is perfect for bench work due to the fact that the speed sensitivity is easily regulated with the push of a button; this enables very precise positioning of the load. They are frequently used in many industries for lifting and turning components for repair and maintenance work as well as manufacturing processes. If the mini manipulator is used in conjunction with a trolley, then it will have the additional benefit of being able to traverse across the beam.